While Kevin Durant does not have an energetic sidekick like Michael Jordan did in Mars Blackmon, the popularity of his signature Nike shoe has developed just as much of a cult following in recent years. But with recent expiration of the seven-year $60 million dollar contract that he signed his rookie season in 2007, Durant fans could be in for a major change. With this type of growth and success you would think that it would be an easy decision for Durant to resign with Nike as he is now second only to LeBron James in regards to apparel profitability. Durant is a loyalist: to his mom, his teammates, Thunder fans (for now) and the DMV area where he is from. Coincidentally also located there is sports apparel brand, and public enemy #1 to preventing Durant from resigning with Nike, Under Armour. The Baltimore, Maryland based company has done a great job in recent years carving out a significant niche in the industry. After entering the market by selling compression undergarments for athletes in 1996, the brand has grown to become the official sponsor of the NFL Combine and on January 21, 2014 announced that it had reached an agreement to be the exclusive outfitter for Notre Dame Fighting Irish Athletics over the next 10 years for a reported $90 million dollars. The deal with the Fighting Irish shows that the brand is serious about being a power broker in the apparel industry and that they are willing to spend money to secure a super star name — and next on their radar is Durant. 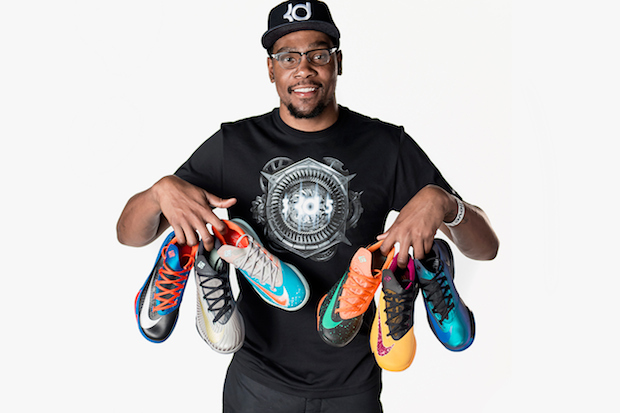 They company realizes that if they want to be able to snag a big fish in the shoe game like Durant, they have to hope that the reported $30 million dollar offer is enough to lure the hometown hero away from Nike. However one thing that Nike does have going for it is that shoe consumers tend to be loyal to the brand over the endorser. When stars like Kevin Garnett, Chris Webber and Jason Kidd all left Nike for less popular brands the sales and marketability from their name did not follow. Being the new name of Adidas, Dada and Peak could not overcome the power of the swoosh and even now the retro shoe releases of these former Nike athletes are more popular than any shoe released by the new company. Under Armour will have to consider the high-risk low-reward of signing Durant for that large of a deal without the guarantee of the fans of his Nike shoes following. As it stands if Durant were to leave Nike for Under Armour the deal would give him the highest shoe endorsement deal above LeBron James (whose deal with Nike is worth $20 million) and for a player that has struggled with finishing second to James in many categories, being able to surpass him on this list while being the face of an opposing brand has to be enticing — but then again we are talking about a guy that has shown a high level of devotion to everything around him. But if Durant does leave for Under Armour, this could be a precursor to a bigger departure in a few years when he becomes a free agent in his 9-5 job and if that happens, the power of the Under Armour brand could be influential in the magic trick that makes him disappear out of Oklahoma City. The Next Great Sports Activist… Is there anyone qualified? Great article. I can understand him wanting to leave Nike for Under Armor if UA is willing to shell out $30 million, but like you said in your article, the consumers rarely follow when athletes leave Nike. He has to ask himself does he want to be the face of Under Armor and be huge in OKC and DC or does he want to stay with Nike and be ubiquitous.